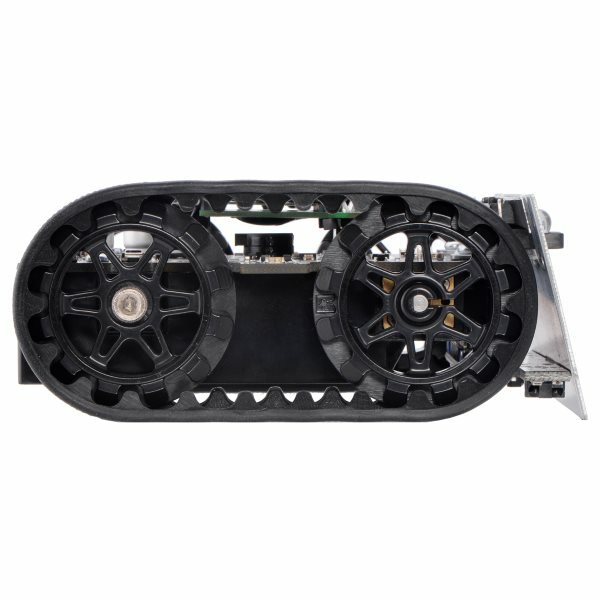 The Zumo 32U4 Arduino Compatible Tracked Robot features high torque treaded wheels and integrated sensors. 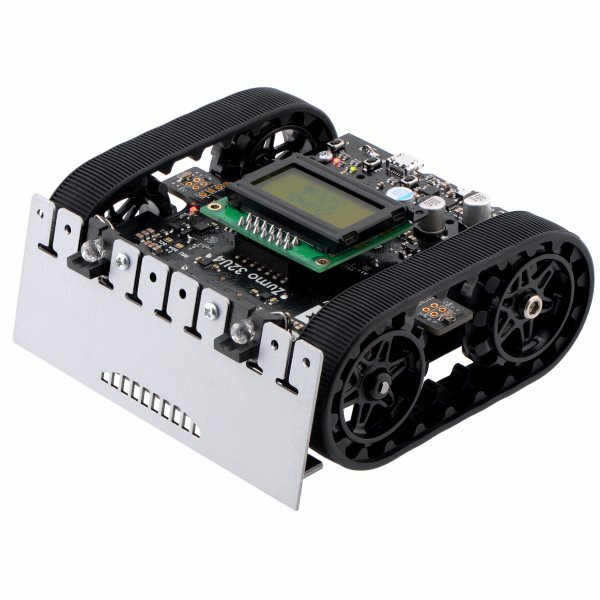 The Zumo 32U4 is a fully programmable robot with an Arduino compatible ATmega32U4 microcontroller. It is small enough to qualify for Mini Sumo competitions and versatile enough for a variety of robot projects. It comes has built in motor drivers, integrated sensors and a convenient user interface. This small Zumo robot has dual h-bridge motor drivers that power two high torque 100:1 micro gearbox motors. It uses treaded tank like tracked wheels to provide significant traction. Each motor has an associated quadrature encoder for closed-loop motor control. It can drive up to 20 inches per second while loaded to 500 grams of weight. The motors have a stall torque of 30 oz-in for a powerful push. 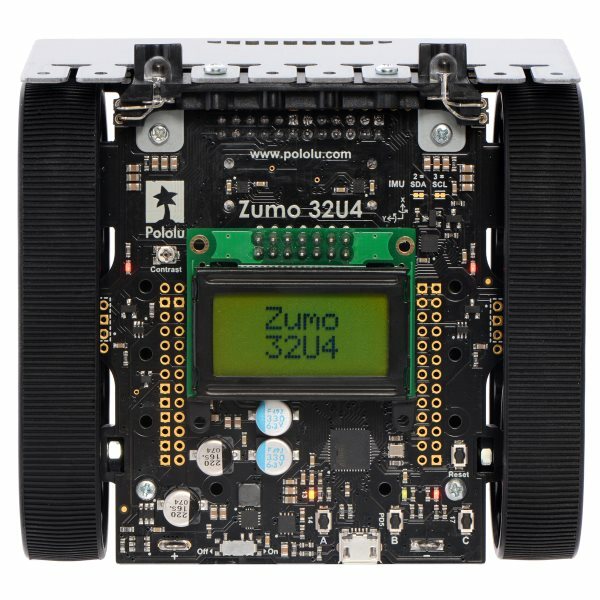 The Zumo 32U4 comes complete with a variety of integrated optical sensors and a complete inertial measurement unit. Five downward facing IR Infrared reflectance sensors can be used for line and maze following or boundary and edge detection. Front and side facing proximity sensors provide obstacle and range detection. A 3 axis accelerometer, gyroscope and magnetometer provide real world orientation and crash feedback. 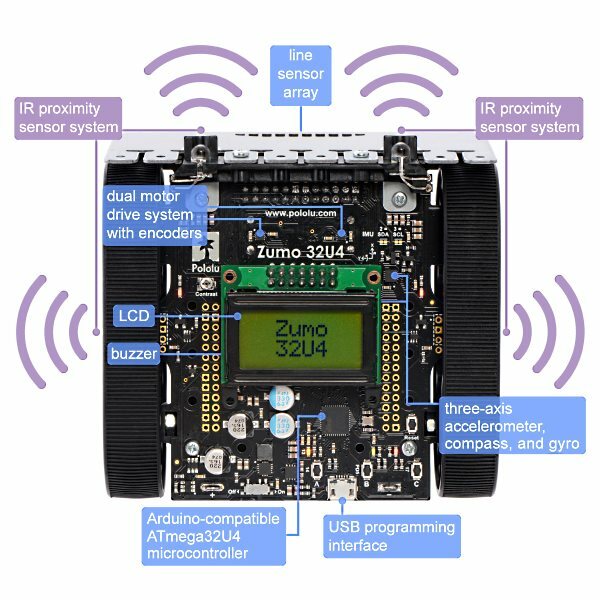 An LCD display is the center of the Zumo 32U4 robot's handy UI. Three user input buttons make it easy to interact with your program. A built in buzzer can generate audio feedback. Indicator LEDs provide useful operating diagnostics. Advanced users can expand the robot via through-hole solder pads with access to the microcontroller's I/O lines. The underside of the Zumo 32U4 contains a battery pack for 4 AA batteries. The robot can be powered from alkaline or rechargeable batteries. We recommend rechargeable NiMH AA batteries. An Atmel ATmega32U4 AVR microcontroller provides the Zumo 32U4 robot's brain. It comes preloaded with an Arduino compatible bootloader to allow programming from Arduino IDE via the built in USB interface. An Arduino library is available to simplify programming. The Zumo 32U4 robot comes fully assembled and ready to play. Just add batteries. A USB type A to Micro-B cable is required for programming.